Paris was a crowded city in the late 1700s. It had a burgeoning population clamoring for housing and burial plots. The city's churches maintained their own graveyards within city limits, but they were overcrowded and unsanitary. To free up valuable real estate and get rid of the health hazard, they dug up the graves — all of them. In 1786, officials dug up the entire below-ground population of Paris and moved the remains to abandoned quarry tunnels outside city limits. It took two years but all the dead were moved into the tunnels, which are now called the catacombs. The city would later use the bones to create elaborately stacked walls and structures that are awe-inspiring yet totally creepy. 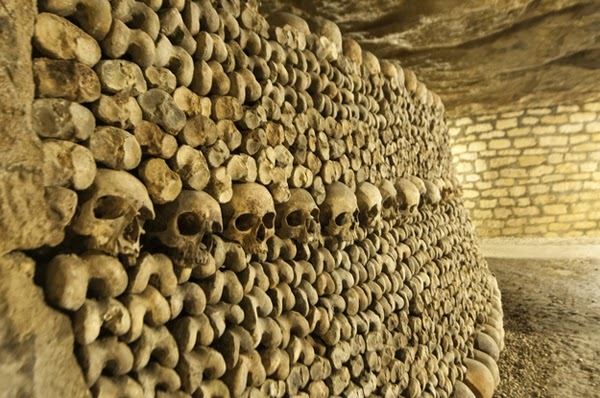 Imagine all the lives those bones represent — a 1,200-year history in the catacombs. 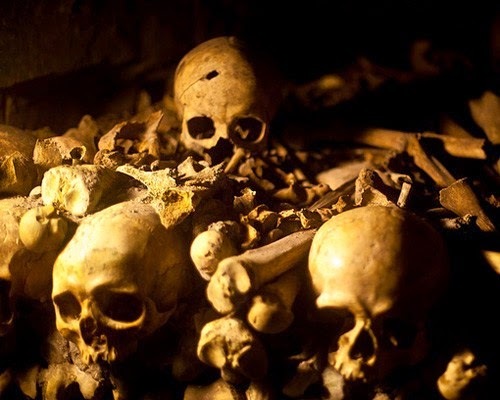 You can visit the catacombs for about $10, and more adventurous travelers can discover some of the city's more illicit tunnels. (However, a 1955 law made entrance into the catacombs illegal, and there's a 100 Euro fine if you're caught by the special tunnel police.) Check out this collection of curious photos from the catacombs. Paris, City of Light, really is a tale of two cities. One of them is above ground, with its beloved Eiffel Tower and Arc de Triomphe. That's the city the world sees. And then there's the city very few us will ever see — an underground Paris, the souterrain. Below the city, concentrated on the south bank of the river Seine, hidden limestone quarries dating back centuries provided the stone for Paris' great monuments like Notre Dame. The mining left behind a labyrinthine maze — at least 180 miles of abandoned tunnels, secret rooms and caverns, odd wormholes barely big enough to wriggle through, running directly below some of the best-known city streets.